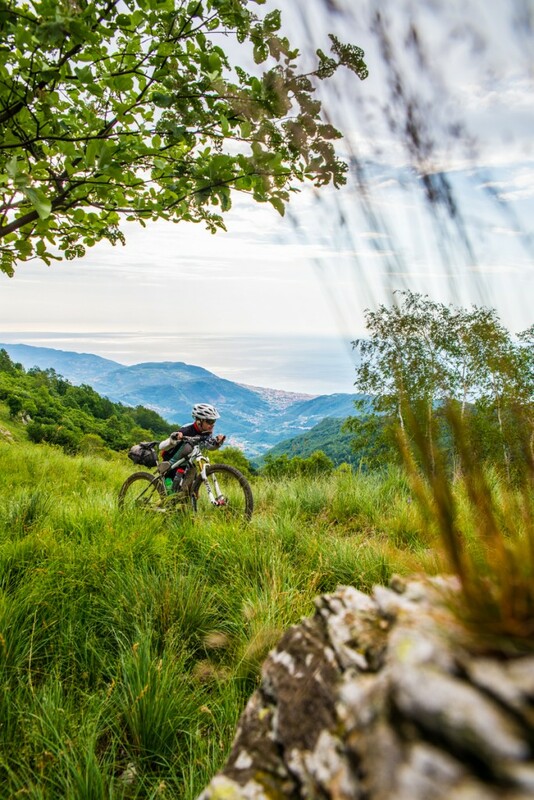 Liguria Divide Mountain is a mountain bike adventure, an ultra endurance running through the interior of Liguria challenging themselves and their stamina. Liguria Mountain Divide is a challenge in one stage developed on the formula of the great challenge developed in the United States, such as the Great Divide. These are events in long or very long-distance, where the athlete participates without external support and without constraints in one unique stage: from start to finish, the athlete is free to decide where, when and how to stop to eat and rest, trying to close the route in the shortest possible time. Bikers are not allowed to refer to the organization for their own needs and the only support is authorized commercial structures located on the territory (shelters, shops, hotels, bars and restaurants) and available for all participants that pay for them. The event aims to promote cycling adventure, contact with nature and the discovery of the Ligurian hinterland. The challenge of Liguria Mountain Divide is based on a single principle: ride a bike route that follows the direction of the Alta Via (High Way) of the Ligurian Mountains from end to end, as quickly as possible, in solitary, in the mode of self-sufficiency (without external support). There are about 550 km and almost 20,000 vertical meters to go from east to west, starting from Bolano (La Spezia) to get up to Airole, just above Ventimiglia crossing the four provinces of Liguria. The course, challenging and highly spectacular, follows the chain of the Ligurian mountains offering breathtaking views and ever-changing environments, the woods, the bush, the grasslands of the mountain, from the bottom of the valley and the sea level to the highest peaks, across countries and characteristic villages. Dirt roads, paths, singletrack, connections on asphalt, stretches of portage challenging one another without end making the trip a sequence of endless surprises. This adventure is reserved for certain that all cyclists can tackle the course of Liguria Mountain Divide at any time, in either direction, in order to qualify for the General Classification of the event. The best time to deal with the LMD goes from late spring until autumn. I you want to go along with other bikers motivated to achieve the best time, there is a official starting Saturday, June 18, 2016, coinciding with the departure of the Alta Via Stage Race from Bolano (SP). The key aspect of the event is that the attempts on the entire route there will be in solitary mode, in self-sufficiency, in complete autonomy, considering the route as a single stage. So after the start the stopwatch starts and stops upon arrival, day and night. The challenge is completed on arrival at the point opposite to that of departure. There are no intermediate control points or mandatory rest periods during the journey. There is no time limit to finish the event, however, considering a final time competitive for the entire Liguria Mountain Divide staying below 7 days, taking into account that the Alta Via Stage Race through it in eight stages and in 8 days. To complete the course, a biker can buy food / equipment, rent a room, wash clothes, also to repair the bike at shops and other businesses along the road (shelters, hotels, restaurants, bars, shops …). Any services used must be available on the market for all participants in the LMD and not pre-arranged. There shall be no private refueling, nor the private accommodation or acquaintances. In this way all the competitors enjoy the same equal opportunities, relying on its own strength and resources available to all. The route passes through large tracts uninhabited or without any commercial structures, so you need to carefully plan the supplies of food and water to avoid having to give up the route and then having to go back and resume at the same point.